* See Rousseau’s fascinating essay The Government of Poland for some discussion of the uniqueness of Polish political institutions. Sitting between the German and Russian poles of Eurasian land power, it has been the Poles' suspicion of a strong central authority that has, with cruel irony, doomed them to partition and oppression for centuries. Excepting perhaps Ireland, nowhere in the world has a country's nationalism been so tightly bound up with (and nourished by) its Catholicism. A fascinating, tragic, striken land. I've long believed the fate of the West (and Poles are very keen to think of themselves as Westerners) and the fate of Poland were inextricable. I'm curious about the relationship between the Polish coat-of-arms (I assume that's the picture on the right of this post) & our own logo, with the crucifix, & the orb, & the crossed keys, & the second eagle's head. Do they both descend from the Hapsburgs? 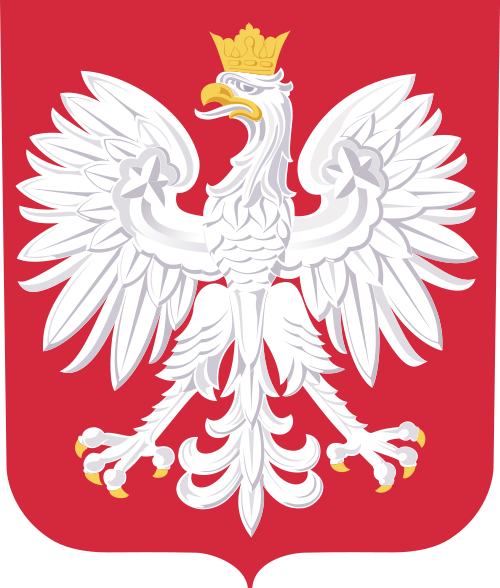 I infer from the Wikipedia entry on the Polish coat of arms that there is no relationship between the Byzantine (which we've used here), and (later) Russian double eagles and the Polish eagle; the former symbolized the (ideal) symphony of Church and the Christian imperium, and was adopted by Russia after the fall of the Eastern Empire, while the latter appears to originate in indigenous Polish myths. The 'symphony' idea is just about the earliest piece of Christian political theology, and one of the most resonant, both conceptually and aesthetically, which is why it also appears in the Holy Roman Empire, the Habsburgs, etc. Maximos - thanks for setting me straight on that. Actually, the name of the site of the battle is not Liebnitz, but Liegnitz, or Legnica in Polish. A scant reliable information on the battle has been available to historians hence their widely different interpretation of the event both with respect to its scale, importance and consequence. Not a few think it a minor skirmish that grew up to become a popular myth. As for its significance for stopping and reversing Mongol overwhelming of the West most historians seem to agree that it had none since their leaders never intended to continue pushing further westward. Their plan was to turn south to join their main force in Hungary and this is what they did. "The soul of Poland is indestructible, and (...) she will rise again like a rock, which may for a spell be submerged by a tidal wave, but which remains a rock." One that's very literal-minded: Pulaski died in American coastal waters, on board the privateer brigantine Wasp. U.S. Major General Johann de Kalb (a relative, the "de" is fake) actually did die on American soil, at Camden, South Carolina, as a result of wounds received at the Battle of Camden. So Pulaski was not altogether unique.